I saw Queen Felicity today. I was changing the floor of the Pond Hive. 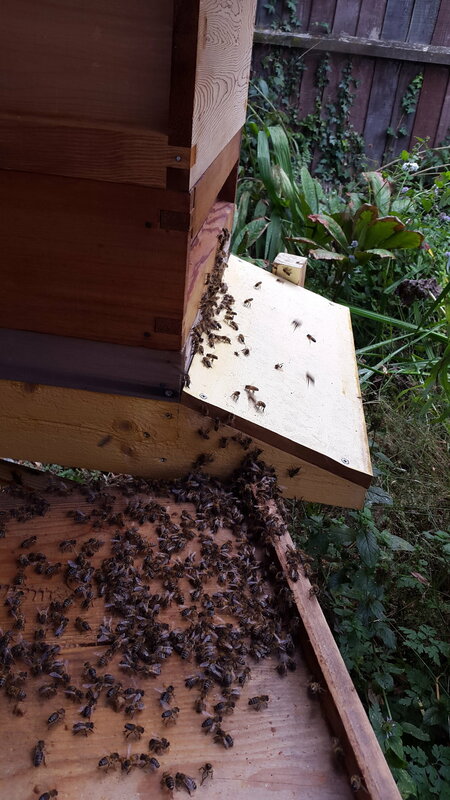 You don't normally change the floor of a beehive, but the Pond Hive was assembled in rather a hurry when Queen Felicity's swarm needed housing and it got a Smith floor, which was a bit too small and had to be combined with an offcut bit of wood from the garage. I was replacing the floor with a national floor, which is the right size and has an adjustable doorway and an open mesh. The mesh provides ventilation and lets varroa (parasitic mites) drop out of the hive. 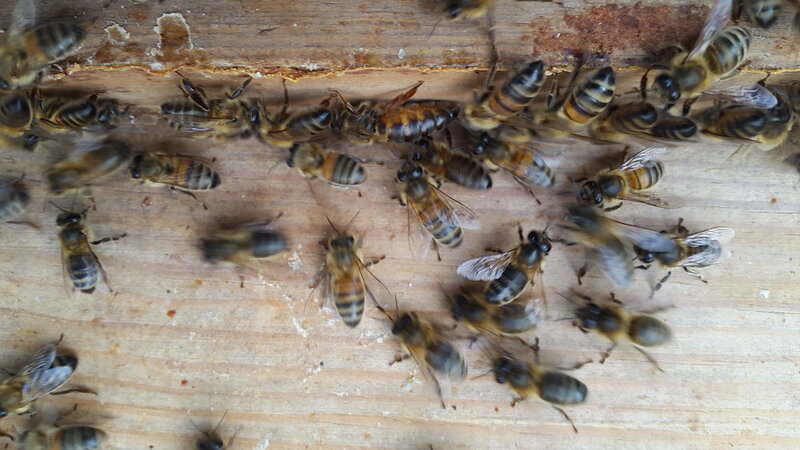 When I removed the brood box to access the floor beneath, there was Queen Felicity. I hope I never become blasé about seeing Queens. They are captivating. Of course, my immediate thought was "She's in the open! Mustn't lose her!" - it would be the end of the colony if she were to be lost, injured or killed. I caught her up between a bee brush and a hive tool, and dropped her between the frames of a super sitting on the new national floor. Then, off came the old floor and on went the new floor and the super and brood box. 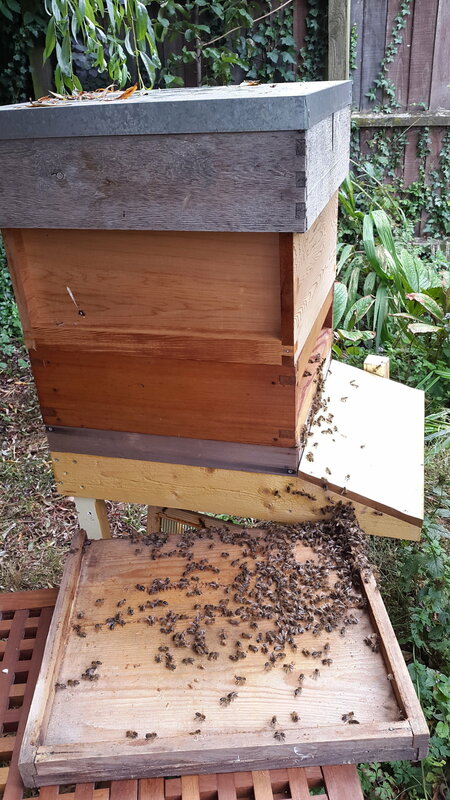 The Queen will have got separated from her attendants during this process (and the super would be full of foragers rather than house bees), but I hope they found one another soon enough. 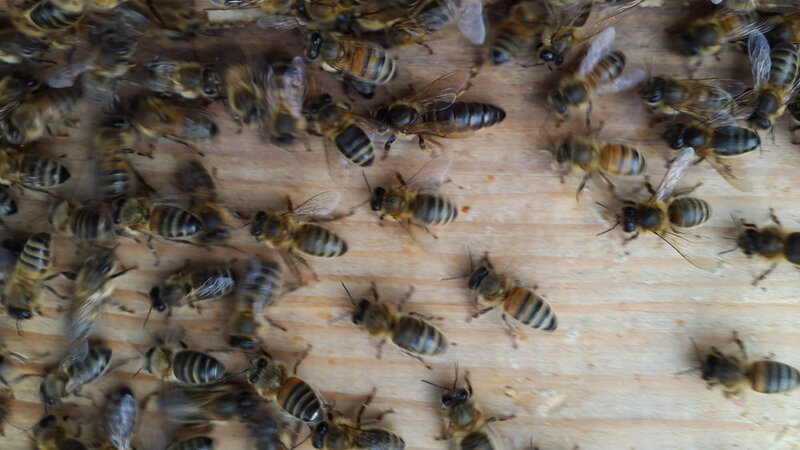 It's rare for me to see the Queen when I look in a hive. I don't usually search for her, but sometimes I'm lucky and catch sight of her when looking through the frames. If you actually have to search for a Queen, it's a bit like "Where's Wally". There are tens of thousands of bees in a hive. Where's Wally? Charging out of shot, surrounded by her retinue of followers. Don't strain your eyes...I've already taken the Queen off the floor! The Queen walks differently from the other bees. Queen Felicity was moving fast! She also has different coloured legs - hers are reddish brown whereas those of the workers are black. 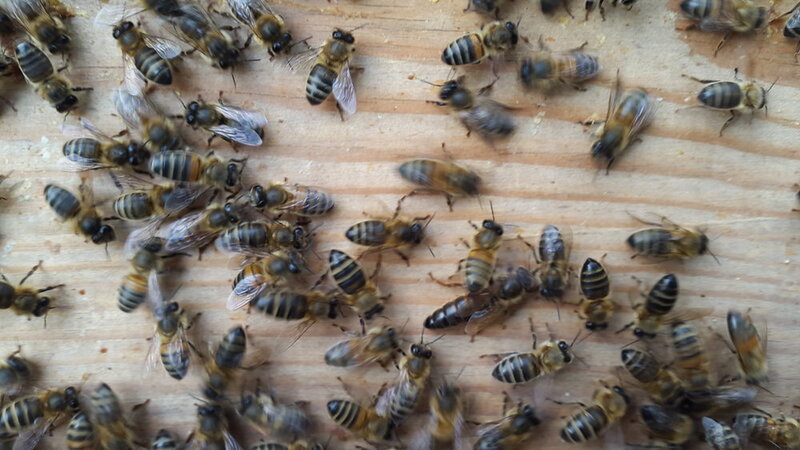 I left the bees on the old floor to find their way home, and they already have.